This post is provided as a follow-up to the “Video Clinic” session on February 8, 2018 in support of Bobette’s Buster’s “8 Minutes and Under” workshop at Northeastern University, Spring 2018. Let me know if you have any comments or questions via the comments or email me directly if you are a student in the workshop. — David. Fundamentals.Visual Storytelling: The Digital Video Documentary by Nancy Kalow (Center for Documentary Studies at Duke University, 2011, download PDF) provides an accessible and concise introduction to making short documentaries with modest gear. If you read this before jumping into production on your first video you’ll have a foundation in terms of fundamental concepts and approaches to get you started. It’s a reasonably quick read and encapsulates the essentials in a readable format. Observational video. Even if your video is interview based, it’s the observational and b-roll footage that’s going to help you during the editing phase to make it flow and keep it interesting, viewers grow impatient with too many talking heads, they want to see the world your protagonist lives in. Rachel Strickland writes in “Notes on Spontaneous Cinematography” (Spontaneous Cinema, download PDF) “shooting observational video is not a matter of aiming and firing, it requires you to release yourself from rational images of what something means and using your eyes and ears to respond to unfolding patterns and developments in the situation, and moving the point of view to account for several forces to be examined from one instant to the next.” Her notes are textually sparse yet dense in wisdom. Shooting guidelines. Take a look at my blog post “Twelve Essential Documentary Shooting Guidelines” (Kino-Eye.com, November 9, 2014) for a list of shooting guidelines that will help you bring home better video. Structure. Take a look at my blog post, “Four approaches to structuring micro-documentaries” (Kino-Eye.com, November 17, 2014) for suggestions on how to structure your micro-documentary and some examples of each of the structuring strategies. Don’t worry too much about gear on your first project. The intimacy and rapport you develop with your subject is more important at this point than mastering technical craft. Consider shooting your first video with a smartphone or an easy-to-use consumer camcorder to keep things simple. If you already own a video camera that is capable of shooting high definition video, use that. When you’re starting out, the best camera is the one you have. That said, you should be concerned about recording good, clean sound. If you are using the built-in microphone on your smartphone, don’t shoot more than three feet away from the subject and only shoot in very quiet locations. If you are using a camera with a microphone input and a headphone output, you can use an external microphone and use headphones to monitor your sound and this gives you more flexibility with camera placement. The trick is to get the microphone as close as you can to the subject so that the sound you want is far louder than the background noise you don’t want. Always monitor your sound and adjust input levels. Some cameras don’t have a headphone output and that means you’re flying blind as far as sound, and sound is half of the picture. Always monitor the sound you are recording over-the-ear headphones or sound-isolating earbuds and figure out how to set proper levels on the camera or recorder to avoid too-low of levels or excessive peaking. Basic sound recording is one technical hurdle you’ll need to jump over, otherwise, you’ll be very unhappy when it comes time to edit. Really. So practice shooting sound and picture before you shoot your first interview. A portable sound recorder will resolve the audio shortcomings of shooting with smartphones. The microphone built into the camera is usually in the wrong position (too far away from the subject) for getting good sound. What should you do? The easiest way to accomplish this is to use a portable sound recorder. I carry a Roland R-05 sound recorder in my backpack so I am always ready to record sound. The R-05 has recently been superseded by a newer model, the Roland R-07 ($229.00) that has some nifty features like remote control with your smartphone but I’ve not had a chance to use it. If you’re recording sound with the built-in microphone outdoors on a windy day you’ll need add a windjammer, otherwise wind noise will ruin your recording. Get a good entry-level microphone. As far as microphones, I recommend pairing your portable sound recorder with a good microphone. There are many different kinds out there, but for the most versatile starting point I suggest the Podcasting Omni Stereo Microphone (it’s actually a pair of omnidirectional lavalieres terminating in one stereo input plug) from Giant Squid Audio Labs ($75.00). This is a pair of omnidirectional (captures sound from all directions) lapel microphones that works off plug-in power provided by most recorders so you don’t have to mess around with little button batteries. It’s perfect for recording one or two-person conversations and it won’t break the bank. If you’re shooting outdoors on a windy day you’ll need to add some lavaliere windjammers to these microphones, otherwise wind noise will ruin your recording. Need a tripod mount? For attaching my iPhone to a tripod or monopod, I use the Cinetics SmartMount ($20), a small and versatile option for attaching a smartphone to a standard 1/4-20 thread (the tripod standard). This little critter is built from black anodized aluminum and is designed to attach to a bare phone. Need a micro-size tripod? The Joby Gorillapod Original ($20) is the mini-tripod I use, I like the flexible, multi-segmented legs for attaching my iPhone to a variety of objects or just setting it down somewhere. Each of the joints bends and rotates, making it easy to conform the legs to uneven surfaces or wrapping it around objects. There’s a version that comes with an iPhone mount, but I prefer to use the Cinetics SmartMount which is more secure. Need a small tripod? MeFoto sells a line of small, lightweight tripods that work well with D-SLRs and can also be used with a smartphones with the Cinetics SmartMount. I own the Globetrotter Classic model with carbon fiber legs and use it with both my Panasonic GH4 and my iPhone. It fits nicely in an carry-on suitcase and it’s also good for hand-held work because it converts into a monopod (see the next note for details). A monopod will help you pull off smoother hand-held shots. Forget all the fancy stabilizers and camera rigs, you’re better off spending that money on sound gear! When you are starting out the first camera support device I suggest you get is a monopod (or a tripod that converts to a monopod) and it will help you pull off a wide-range of camera moves, see “Master your monopod – Some monopod tips for creative shooting” (Steve Fairclough, The Video Mode, August 30, 2017) for a demonstration of several monopod shooting techniques. You might need releases. It’s polite to ask people permission to include them in your video. In many states, including Massachusetts, it’s illegal to record people’s conversations if they don’t know that you are recording them, so always let people know what you’re doing.For more on releases and forms you can download, see my blog post “Release Forms for Documentary Productions” (Kino-Eye.com, September 17, 2015). The seven habits of good interviewers include: 1. Get a signed release form (including contact info), 2. Do your research and preparation, 3. Have empathy and respect your interviewee, 4. Prepare good questions (but let your interviewee run with what excites them), 5. Interview for the edit (you’ll appreciate having complete sentences when you are editing), 6. Practice active listening, and 7. Pause after each question (give your interviewee time to think and get good room tone too). For an extensive collection of tips on interviewing, see my handout “Notes on the Interview” (download PDF). Edit with Adobe Premiere Pro CC. Yes, there are some easy to use entry-level tools available for editing, but you will quickly run into a brick wall with them the moment you want to do something interesting, so I suggest jumping right in and learn basic editing using Adobe Premiere Pro CC (Creative Cloud, including Premiere Pro, is $19.99/month for students and teachers). It’s a widely- used cross-platform application available for both MacOS and Windows. The Getting Started tutorials on the Adobe site or the Premiere Pro CC 2017 Essential Training: The Basics tutorial from lynda.com will get you started (you don’t have to do the whole thing, you can skip around and focus on the fundamentals). If you’re a Mac “fan boy/girl,” you might consider Final Cut Pro X, a full-featured editing system that’s easy to learn. I’ve used it but still prefer to work with Adobe Premiere Pro CC. Dealing with double system sound in post. If you used a separate sound recorder to record sound in sync with video (called “double-system sound”) you’ll need to sync your sound recorder sound with your camera clips. The easiest way to sync double-system audio and video is with the Plural Eyes utility from Red Giant Software ($149.00, academic). You can also sync your double-system audio and video one pair at a time in Premiere Pro CC using the Merge Clips feature. When shooting double-system, make sure your are recording sound on the camera too, even though you’ll be tossing out the camera audio, sync utilities need the sound on the camera to match the sound files to the video! Export settings. If you use Adobe Premiere Pro CC to edit your video, I suggest the following settings when you export: Format: “H.264” and Preset: “Vimeo 1080p” for a video that will be relatively compact and reasonably high quality and in the right format for uploading to Vimeo (basic accounts are free and Vimeo is good way to share your video with others in a clutter-free and ad-free environment). Adobe Clip. If you are shooting on a smartphone or tablet, Adobe’s Clip application lets you start editing on an iPhone or iPad and then you can move your project to Adobe Premiere Pro CC to finish editing your project. I think it’s a funky program and I prefer to go straight into Adobe Premiere Pro. FiLMiC Pro. The standard video recording app on the iPhone is no frills. Once you have been shooting video for a while you’ll start expecting more from the camera and if you do not want to move up to something with a D-SLR form-factor, you might want to check out FiLMiC Pro ($14.99 for iPhone via App Store, $9.99 for Android via Google Play). This app provides a range of features that turns your smartphone into a better video camera, giving you manual control over things like exposure, frame rates, resolution, and other key features like slow-motion, time-lapse, aspect ratio guides. Unfortunately, the app is a tad temperamental and crashes once in a while, and it still happens (but less often) with newer releases. 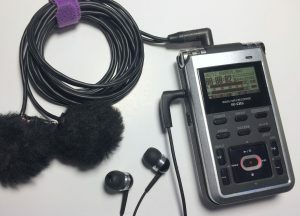 If you are using a D-SLR or similar form-factor camera with a mic input and a headphone output, consider adding a directional microphone like the Rode Video Mic Go with a furry windshield, along with an extension cable and Rode Pistol Grip to your kit. This makes a good starter microphone, it works well with any camera or sound recorder that provides “plug-in power” (supplies power to the microphone via the mic connection) so there is no need to fuss with annoying button batteries. For fiction filmmaking and some documentary work, you might want to have a boom pole around, Rode makes an inexpensive one and the Rode grip will attach to it. The feeling of being there. Richard Leacock (1921-2011) was among the filmmakers of the American cinéma vérité movement together with Robert Drew, D.A. Pennebaker, Barbara Kopple, and the Maysles brothers (Albert and David Maysles). This movement changed the way documentary films were made. An example of Ricky’s style is Les Oeufs à la Coque de Richard Leacock (Richard Leacock and Valerie Lalonde, 91 min, 1991) [view preview], an observational film about nothing in particular, a love letter to Paris, a charming example of his filmmaking style. Ricky wrote about his filmmaking philosophy in the essay “A Search for the Feeling of Being There” (May 20, 1997, download PDF). Running Fence (1978, Albert Maysles, David Maysles and Charlotte Zwerin, 56m) [view on Fandor], a document of Christo and Jeanne-Claude’s struggle to build a 24 1/2-mile-long, 18-foot-high fence of white fabric across the hills of northern California was nominated for an Academy Award and in my estimation is one of the best examples of American cinéma vérité filmmaking and observing struggle that resonates to this day. When you’re ready to dive into the thicket of video production craft, the best general production handbook I’ve come across to guide you through your journey is The Shut Up and Shoot Documentary Guide by Anthony Q. Artis (Focal Press, 2nd ed. 2014, available from Amazon), and his filmmaking courses on lynda.com are very good if you prefer viewing over watching. Shooting for the edit. After you’ve shot, edited, and screened your first short video, it’s time to reflect on what you accomplished and make another one, since video is learned primarily by doing. To help your second project go more smoothly, I recommend investigating the notion of “shooting for the edit” (thinking about the multiple angles you need to make it easer to edit a scene while you are shooting). Michael Wohl’s “The Language of Film” (Ken Stone’s FCP Web Site, 2008) provides an excellent starting point for thinking about editing, and while he’s discussing fiction cinema but the the same rules apply to documentary. Wohl presents a good introductory framework in which shots are used to answer basic questions: who, what, where, when, why and how, providing viewers with the basic components they need to “read” a story, providing information just in time as the viewer is wondering about them. Wohl suggests that if you dwell too long on one of the questions, without answering the others, the video will become tiresome and the audience stops watching. In film language, these questions are answered by different types of shots. Documentary ethics. Carl Pryluck’s classic article, “Ultimately We Are All Outsiders: The Ethics of Documentary Filming” (Journal of the University Film Association 28:1, 1976, pp. 255-267, download PDF) is highly recommended and while dated, it still provides one of the best and concise introductions to documentary ethics. Online resources. The Video Mode is a good place for some good short and to the point tutorials. No Film School is a good resource for up-to-date information on media making tools and techniques, lots of excellent articles and their weekly newsletter is good if you want to start up-to-date with what’s happening in the world of independent filmmaking. DVinfo.net is a good forum for technical advice from practitioners and novices are welcome (as long as you play by the community rules), the forums are well-organized and actively moderated. Good luck! I’m happy to help you out with any aspect of video production or media technology and I look forward to seeing your videos!